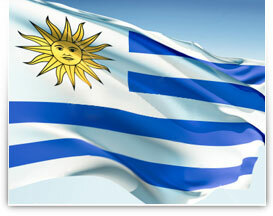 Uruguay is strategically located on the north shores of the Rio de la Plata. Being the second smallest country in South America it is often by passed by visitors to Latin America. However the 650kms of white sand shoreline are dotted with quaint towns and Beach resorts. The unspoilt interiors are lush green and home to various animals and birds on the Pampas. The north is the gaucho land and a stay on an Estancia can be an Interesting and enjoyable experience. The Uruguayans’ are a very attractive race and are warm and friendly. They enjoy a high standard of living and have the highest rate of literacy in South America. The prime tourist attractions include MONTEVIDEO the cultural capital, the Picturesque port town of COLONIA and the trendy beach resort PUNTA DEL ESTE. Uruguay is relaxation, rejuvenation and Party destination!